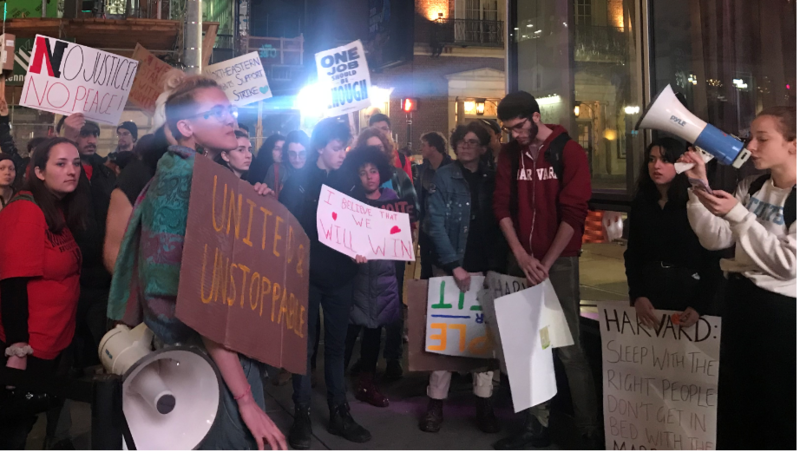 Boston students chanted “No contract, no peace” at The Westin Copley Place and then marched to the W Boston Hotel, joining the Marriott workers during their fifth week on strike Friday evening. Sophomore Mariah Sitner, a member of Boston Socialist Alternative, chanted with the crowd and marched with her sign that read “Stand up, fight back”. 1,500 workers walked out at seven Marriott operated hotels on Oct. 3, creating the first hotel strike in Boston’s history. These hotels include the Aloft Boston Seaport District, the Element Boston Seaport District, the Ritz-Carlton Boston, the Sheraton Boston, the W Hotel Boston, the Westin Boston Waterfront, and the Westin Copley Place. The strikers come from different positions and departments of the Marriott Hotels—the world’s largest hotel company—such as housekeepers, bellhops, valet, and waiters. “In spite of Marriott’s rhetoric that they value their employees, after six months of talks they haven’t been willing to demonstrate that by helping to create jobs that are enough to live in the city, to raise a family in the city and to retire with dignity,” said UNITE HERE Local 26 President Brian Lang, according to WBUR. Enrique Fernandez, Marriott banquet waiter for 29 years, rang a cowbell while marching with the students. “Thank you to the students. They give us the courage to go on. As we say, ‘rain or shine on the picket line’,” said Fernandez.